Partly cloudy skies early will give way to cloudy skies late. Low 43F. Winds light and variable.. Partly cloudy skies early will give way to cloudy skies late. Low 43F. Winds light and variable. Tarring nets are (l to r) Amon, Daniel, Sol (Solomon) and their father, “Uncle Dan” Markham. Though the family came to the West Coast from the inland state of Kansas, the Markhams were enterprising and successful fishermen and well respected by the fishing community of the Lower Columbia region. 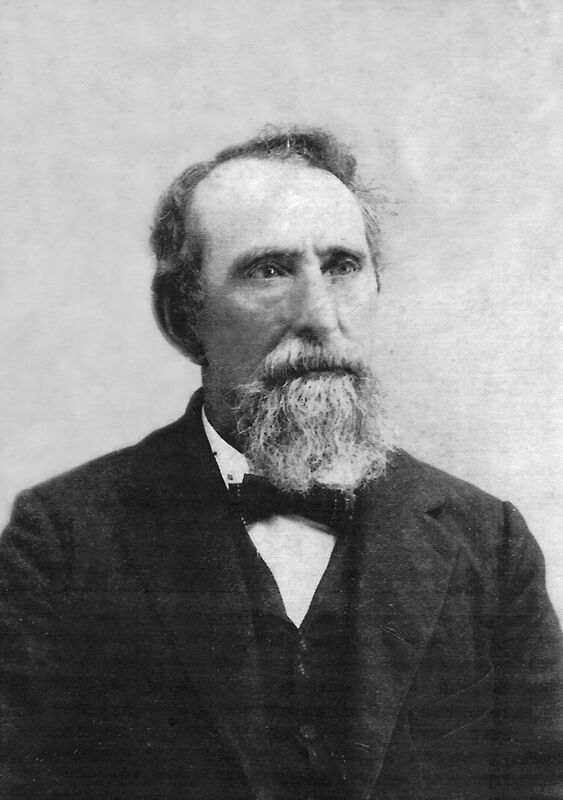 Daniel Markham (1839-1920) arrived in Ilwaco with his wife and family in 1878. He was called “Uncle Dan” by one and all — a sign of the esteem in which he was held. The Markham house, left, occupied a prime location in Ilwaco in the late 19th century. “The Old Markham House” was the second home built on the corner of First and Spruce Streets in Ilwaco by pioneer residents Dan and Ellen Markham. The first one, reportedly more elegant than the second, was destroyed in a fire the night before the family was to move in. Dan Markham was the first of the 13 members of Canby Post No. Twenty-Seven of Washington and Alaska to sign the Grand Army of the Republic Charter on May 18, 1894. He was proud of his service to his country during the Civil War and continued his life of service in the Ilwaco Community as a member of the GAR, a veterans organization for Union soldiers. Dan and Ella Huffman Markham sit on their front porch surrounded by family members, perhaps in 1898 after the funeral of Dan’s older sister, Amanda Markham Wheeler. Pictured from left to right are Gerome Grable, Catherine Grable, Hannah Huffman Pike, George Huffman, Polly H. Simmons, John Huffman, Ida Huffman, Mary Markham Stone, William Markham, Louise Markham, Sarah Huffman, Newton Huffman, and Ellis Wheeler. Editor’s Note: In this series, local historian Sydney Stevens examines the many connections among Pacific County residents — connections with one another and with the past; connections that bind us in special and unexpected ways. Beginning at the South-east corner of the intersection of Spruce and First streets and running thence south along the east-side line of said First street one hundred (100) feet thence east parallel to said Spruce street one hundred feet thence north parallel to first street one hundred feet thence West along the South-side line of said Spruce street one hundred feet to the place of beginning. A photograph of the dismantling appeared in a 1963 issue of the Pacific Tribune. According to the caption, the Markham Home was built in 1894 and moved on skids to the present location two years later when Seaborg erected Doupé’s. The building B.A. Seaborg built was actually his Aberdeen Packing Company, store which served the area for about two decades. It was purchased in 1919 by Joe and Harry Doupé and has been known as “The Doupé Building” since that time. “It’s the house at 125 Spruce where I grew up with my sister Mary and our brother Dan’l. Our grandparents Daniel and Nan Graham Markham purchased it in 1911 and, after several other family owners, it was finally deeded to Ernest and Mary Ann Markham, my parents, in 1951,” Nancy recalls. “When my brother Dan’l and his wife Kathy bought the house, they added a preschool on the west side of the house and my mother had an apartment built in the back. The third addition to the house was for Dan’l’s parsonage upstairs. By that time, members of every one of the Ilwaco Markham generations had lived in that house — five generations to that point counting Dan’l’s daughters. The very first Markhams in Ilwaco were Nancy’s great-grandparents Daniel (“Dan”) and Ellen Huffman Markham. They left Kansas in the spring of 1878 and arrived in the area of Ilwaco still known as Pacific City — now part of Cape Disappointment State Park — the fall of 1879. With them were the first six of their nine children: Amos (11), Ella (9), Solomon (7), Daniel (5), Oliver (3) and Hiram (six weeks). They traveled across the country in a covered wagon pulled by mules — either two or four. No one is certain any longer. Two other memories concerning the trip are still recounted with affection by descendants: Amos, the oldest boy, did the work of a man on the journey while five-year-old Daniel pestered his father for a spy glass so that he might look back and see Kansas as they traveled west. Dan Markham (the elder) had been born in Summit county, Ohio, in 1839. He moved to Illinois in 1850 and took up farming until the war broke out. At the end of the war, he moved to Kansas and lived there until the spring of 1878, when he packed his belongings and moved to Ilwaco in Washington Territory. He fished the Columbia for a living, owned and operated The Kansas Hotel, served on the Ilwaco City Council in 1900, and was much respected as one of the oldest living residents of the town. It is a point of continuing pride for Dan Markham’s descendants that, in 1886, he became one of the 13 charter members of the GAR Canby Post No. 27 of Ilwaco. The GAR (Grand Army of the Republic) was a fraternal organization formed in the post war 1860s out of the ranks of the Union Army. Founded in 1866 in Springfield, Illinois, and growing to include hundreds of posts (local community units) across the nation, it was dissolved in 1956 at the death of its last member. The GAR played an important role in civic and patriotic observances in every community of the nation in the late 1800s and the early part of the 20th century. It was called upon to furnish flags and to lead the parades for every special occasion. Memorial Day was the Grand Army’s own holiday and usually community plans did not proceed without the leadership and approval of the local GAR post. Next to Memorial Day, the old soldiers were most dedicated to observances of Lincoln’s birthday. The Ilwaco Advance of Sept. 17, 1891, tells of the opening of the new Ilwaco school building. As part of the program, the article says: The large and beautiful flag presented by the once GAR post of Ilwaco, was then unrolled and amid loud cheers and demonstrations, Mr. Dan Markham came forward to make the presentation speech. In a reminiscence about early Ilwaco, L.D. Williams wrote in the Jan. 16, 1920 issue of The Ilwaco Tribune: I well remember when uncle Dan Markham came, and soon after engaged in the fishing business, both here and at North river, and was very successful in both bays. He built the largest and finest dwelling house so far erected in Ilwaco, and it was mysteriously burned to the ground the night before the family expected to move in. Aunt Dodie had been married twice — first to Bert Soule, who died within a few years, and then to Frank Embree, who was a conductor on the Oregon-Washington Railroad & Navigation Co., which operated the narrow-gauge railroad that ran from Megler to Nahcotta. Nancy remembers that Aunt Dodie had a wonderful sense of humor and always told great stories. There were four families from Kansas who all arrived in Ilwaco at about the same time — the Grahams in 1876, the Markhams in 1879, the Embrees in 1880, and also the Grables in 1880. Even though the men of these four families — the Markhams, Grahams, Grables and Embrees — had come from inland Kansas, they all became fishermen and contributed greatly to the development that industry in Ilwaco on the Lower Columbia, and beyond. All four families played a big part in the development of Ilwaco. They were active in civic affairs, influential in fraternal organizations, and dedicated in their various church affiliations. According to Nancy, the only other close relative on the Peninsula these days is her cousin, Luanne Hanes, owner of the Olde Towne Coffee Café in Ilwaco. “Who could have imagined that Markham cousins of the fifth generation would both own coffee shops within a few miles of one another!” she laughs.